Cream is a wonderful food to have in your home, important in both rustic farmhouse and gourmet haute cuisine, or anywhere in-between. 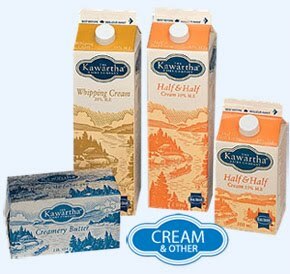 Light cream is about 30% butterfat and heavy cream is at least 40%. Many people cringe at these butterfat amounts, but they shouldn’t. It’s the manufactured industrial fats that are more troublesome. Any packaged foods you could now find in supermarkets are more dangerous than sweet cream could ever be. But if you cook from scratch using natural un-processed groceries, using real cream will be a healthy and tasty addition to your diet. Instead of a “powdered” cream in your coffee, try a ½ and ½ blend of light cream and milk instead. While you are enjoying your cuppa java, read the ingredients on the dry cream label and then quickly toss in the refuse bin. Good riddance and welcome to wholesome cream. You can make delicious whipped cream garnish toppings for waffles, soups and drinks. Crème Chantilly is simply beating a teaspoon of honey and a ½ teaspoon of vanilla extract into one cup of heavy cream. Crème Amandine is one cup of heavy cream whipped with the addition of one teaspoon almond extract, a couple drops of lemon juice and a tablespoon of toasted, shredded almonds. Or you could skip that and just add ¼ cup of almond paste. Put the toast slices in each bowl and pour on the soup. You’ll enjoy this delicious soup for sure.